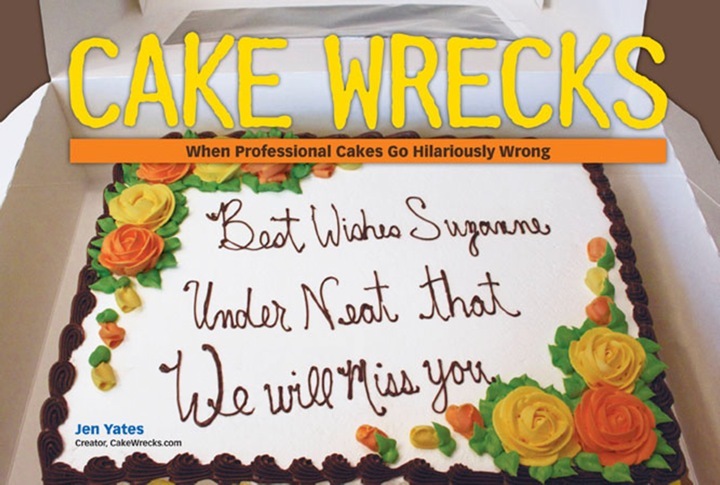 Cake Wrecks - Home - What Do Cupcake Theft And Goat-Keeping Have In Common? What Do Cupcake Theft And Goat-Keeping Have In Common? Ever get the feeling bakers are just as confused by their cakes as we are? AND WHAT THE HELL IS THIS SUPPOSED TO BE?!?! I'm tempted to say it's a patriotic dong, but that is so yesterday, ya know? Then again, I think this baker was just phoning it in. Now to sit back and wait for the only person named Aermica in America to send us an angry email. "I'll have you know that Aermica is a proud Norwegian name meaning 'keeper of goats!'" Expect our retraction statement/apology soon, Aermica. At first I thought this next photo was taken upside down, but the flags are one-sided, so... NOPE. Then apparently shook the whole thing up for good measure. See, it's just like the Boston Tea Party, only without the politics or cute name or any sense of moral compass. Also no tea, so I guess my analogy is stretching a little thin. Thanks to Amber M., Andrea W., Dirk E., Cortney S., Dave H., Melissa M., & Sammy Z. for helping us celebrate Aermica's special day. How pathetic is it to have the spelling in front of you, and you still mess it up? Dsn! Dsn! Dsn! What? No? Sorry. Pretty sure that pic of the flag made with cupcakes where you say someone stole three and then shook it up, was just dropped on its end. If you count the blue circles that I guess are for gluing the cupcakes down, they're 4 across. Then you'll see that there are 4 cupcakes still in a row, but they're shifted tight together. Doesn't change the disgrace of the display, but I notice things like that. It's "The Liberty Bell Telephone". I recognized it immediately. I initially misread the second-last one as "DSM" over and over again. 1) How about a fourth option? A lousy baker who has never seen a flag or a four. 2) This is a NASCAR road racing circuit. 3) It's the very rare Independence Day Flagworm. It's very rare because it's only seen in lousy bakeries. 4) I'm not at liberty to make any jokes about this one. 5) Aermica is obviously a pilot's daughter. 6) That's not "USA". It's "DSN". In this case, it describes the baker - dumb stupid nitwit. 7) Maybe this was done deliberately because their sales were flagging. Ahh, can't wait for the next Olympics so I can proudly chant "D-S-N! D-S-N!" Take a closer look at that last picture. There's four icing glue spots in the top row, and four cupcakes. They didn't steal any cupcakes; just just turned it sideways and shook it vigorously to crush the cupcakes. I think we have have found somebody who hates CCCs with even more of a burning passion than you do. Maybe #2 is supposed to be...... handcuffs? July 4, 2018 | R.
Just for fun, I looked up the name "Aerica". According to one site the name is Nordic and means a leader. You are amazing Jen and John! Hapyy Fourth of July to you and my fellow mnions! @Grrly Girl - brilliant! And if that was the intent then the baker is a genius! But, we know that's not the case! I can hear Lily Tomlin now: "One ringy-dingy. Two ringy-dingy." It is just me, or does the "m" on the Aermica cake look like it is covering a mistake.... BOOM, FIXED IT! That cake is most definitely not upside down. VSN is the acronym for the Vermont State Nurses....if you leave off the A for association. Or maybe its Virginia. Or maybe just a political commentary on the state of this Union at this point in its evolution. If you allow Aermica to be written Ær-mykja, you get ~"Lots of Common Eider". In fact, Keeper Of Goats in Norwegian would be Gjeitebudeie (if the keeper was female). I`m sure everyone was dying to know that. I am *so* going to use Aermica as a character name in a story. It just sounds cool. These cakes, though - not so much. Though Ma Bell would like the 4th one! The "WHAT THE HELL" CCC is a firework. The red is the fiery trail as it rises into the sky, the white next to it is the smoke, and the blue with white dots is the explosion and display at the end. #1 is the Fez of July. @Cynthia - That made me LOL. Fezzes are cool! Well that flotsam just looks like they gave up and flung it on there thinking no one would notice lol. Oh the fun of weird flag wrecks. The Patriotic Dong - is it all soft because it was from "yesterday?" Sorry couldn't help myself. LOL You guys are the best!